So here is my layout - and a small little tutorial on how to make the fun dimensional leaf shapes in the corner. Step 1 - Cut a square, the ones I used in the layout are 2 1/2 x 2 1/2 inches for the small ones and 3x3 inches for the larger ones. You can make them as big or as small as you'd like- just make sure that you have a square. Step 2- Fold the square in half. Step 3- Fold the tips of the square down as shown. Step 4- Open the square back up and glue the tips down to the back of the square as shown. Step 5- Take the bottom tip of the square and add a bit of adhesive. Fold this edge over and that's it! 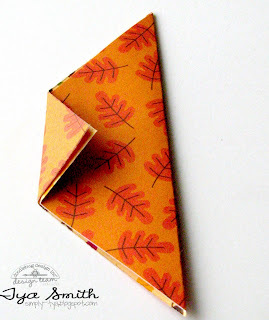 So easy, but so cute if you'd like the leaf to really pop off your project. 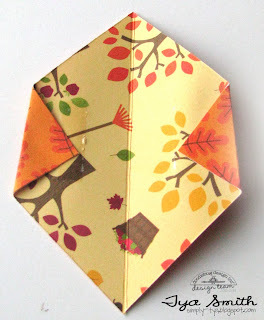 Hi doodlebugs, it's Sherry here today on the blog. Can you believe it is already November? I know it's cliche to say that time flies, but man --- this year is zipping by quickly. For so many people, November is always the time we start to reflect on the things we are thankful for. There is so many things in day-to-day life that I am thankful for, but it always comes back to my family. 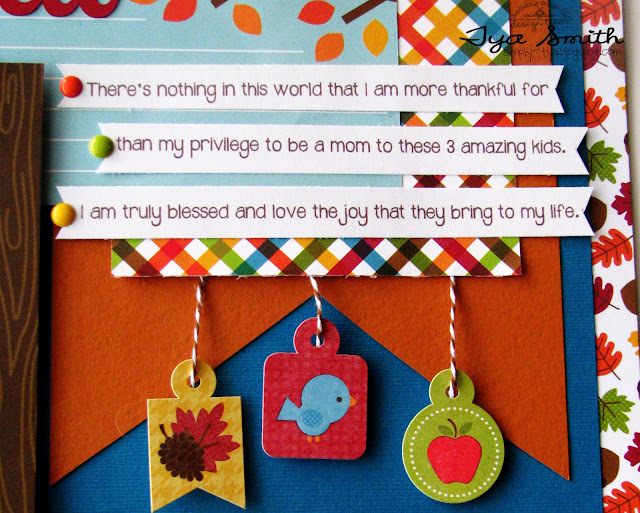 My little family -- my husband, my two children and myself -- is always my greatest joy and for what I am most thankful. I appreciate the sunshine that these two little people bring to my life and my heart. Sure, they can argue and bicker like siblings, but together, they are such great power and joy. 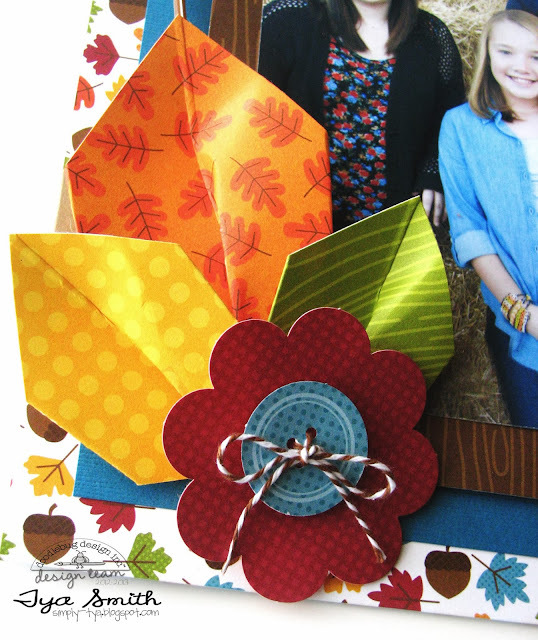 Today I feature them in this layout using doodlebug design's happy harvest collection. On this 12x12 base of grey cardstock, I added drops of golden yellow ink. 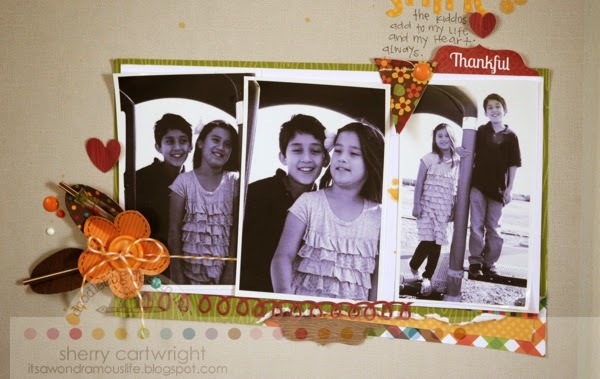 Then, I layered the three photos of my children with a handful of patterned papers. 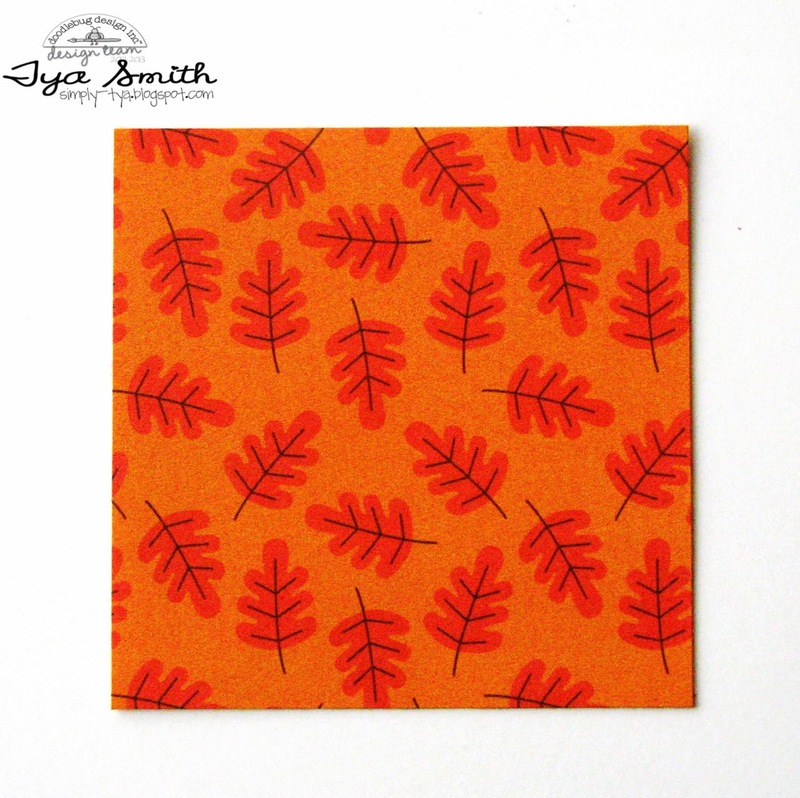 I love how they all work so well together and how the autumn hues are perfect with any photo. The sunflower yellow is an accent color I wanted to feature. Other than the ink droplets, there is yellow in the sunshine die cut, the title letters and the layer under the photo. By using those colors in different areas, it keeps the eye moving about the layout and keeps the design balanced. 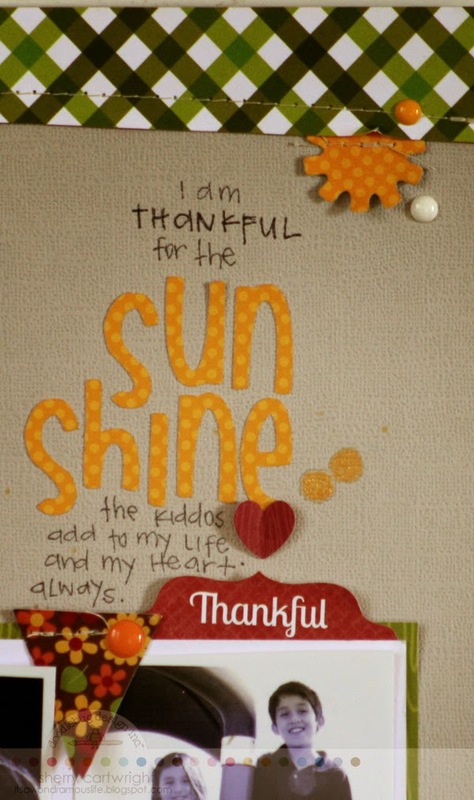 The sun was die cut with a Sizzix + doodlebug stamp and die set and the letter were cut with a Silhouette Cameo. I have a tendency to cluster embellishments throughout a layout. Let's start at the top of this layout with the grouping of doodads and sprinkles. I love all the fall colors sprinkled about. I used the pixie banners here as well. The next cluster is to the left of the photos. I used a die cut flower from a mini kit. To make it dimensional, I scored along the center of each petal and then again in between each petal. Crease each score line and fanfold to create some fluffiness to the flower. 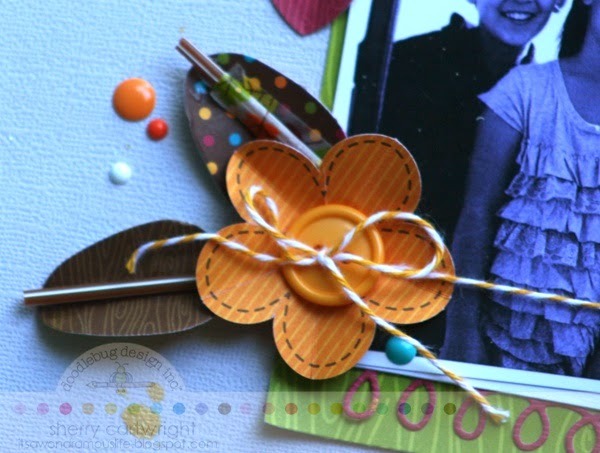 Add a button center and tie doodle twine around the button and a photo. 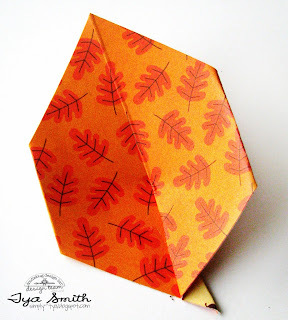 I used a thin die of a tree [from the Sizzix + doodlebug stamp and die sets] to make the leaves. 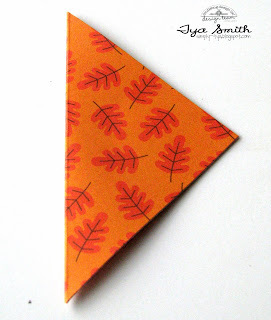 Cut, then crease the center and fold up paper leaves. Add pixie in center -- one I simply used washi tape. 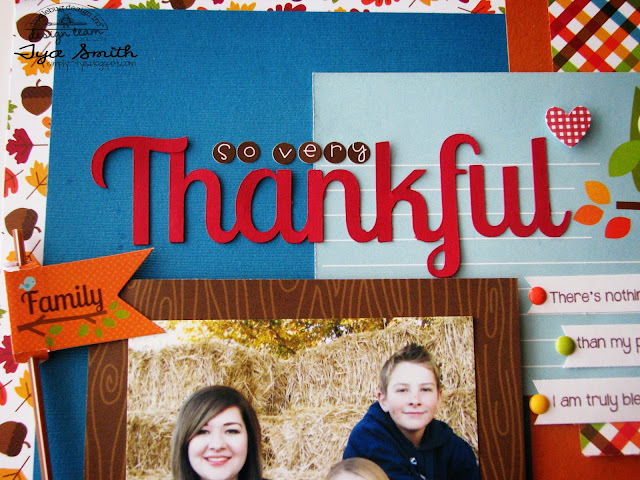 I am very please with this happy harvest layout, using ordinary photos of my kiddos. 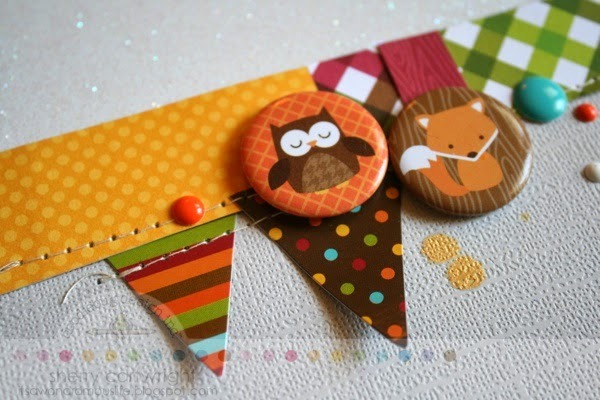 I am inspired by the gals of the doodlebug design team who make layering look so easy. They're inspiring. I've seen plenty of posts around the internet professing gratefulness. Jump on the bandwagon and scrapbook those things you are thankful for --- during the month of November or any day of the week. Be thankful and be blessed. Beautiful layouts and wonderful tutorials. Love both of these Layouts... very creative and unique! This is really an awesome tutorial. I don't think that anything have been missed out here. It is important and quite awesome for this season. Cute layouts! 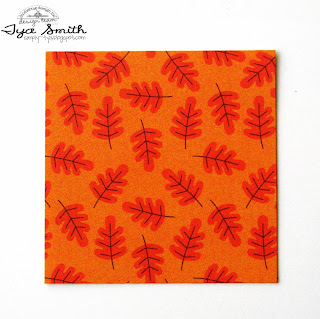 Love the leaves! !